The Eames Management Chair Replica is Manhattan Home Design’s premium Eames office chair replica. 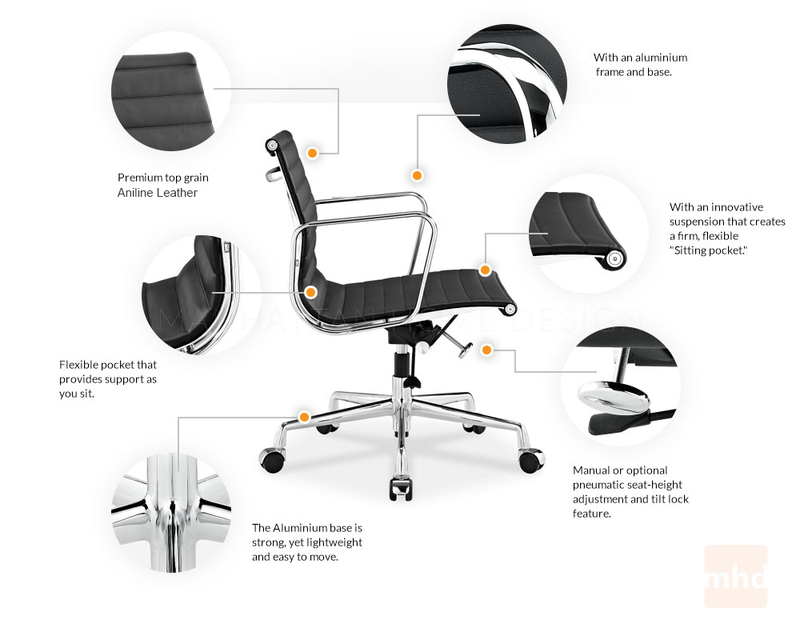 Great for all offices, including home offices, this management style chair suits the most professional of workspaces. You’ll see many variations of this management style chair as it is part of the Eames trailblazing designs in office chairs. Don’t settle for a cheap rendition of this Eames office chair replica, when you can get this superb piece. 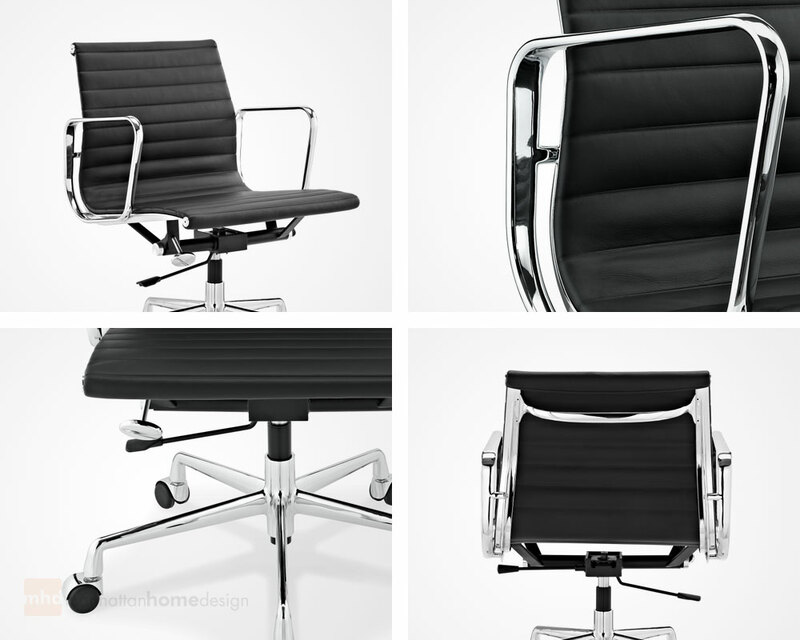 This Eames management chair was originally designed in 1958 and has become a staple as a mid-century modern classic. Set on a five-point base, the Eames Management Chair reproduction sits on tubular steel columns and swivel for easy turning and movement. This high quality reproduction is manufactured to almost the exact same specification as the original. Eames has established a reputation for quality leather-based chairs. Manhattan Home Design offers various chairs in the style of classic Eames pieces, such as this padded executive style office chair. The story behind the Eames name is that of an American husband and wife duo, Charles and Ray Eames, who’ve left a mark on American architecture and furniture in the mid to late 20th century. They’ve designed churches, houses, produced several films and have put their furniture designs to fruition. They were honored with the Royal Gold Medal for architecture in 1979. Classic Black and White Italian Leathers available. Uses #304 steel which is durable, luminous, and is chip and weather resistant. Aluminum alloy chromed frame and base - fully finished. Perfect Tilt and full swivel mechanism - just like the original. Height adjustment with included piston. Five star base with casters protect your flooring from any scratches. Seat Height 17" - 20"
"Great leather on this chair. It is quality stuff. The only beef I have was the shipping. It would have been nice to upgrade to overnight service. This is a good quality chair. I have no complaints about its quality.